YOU BUY RISK FREE. Apostle Ministry provides a 100% Money Back Guarantee for 30-Days on all print books and eBook downloads. Return printed books in resalable condition. Shipping costs are not refunded. 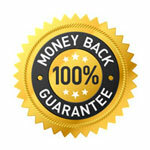 30-Day Money Back Guarantee Refund Policy. Our 30-Day Risk-Free Guarantee allows you up to 30-days from your date of purchase to request a refund of your money. We want you to be 100% satisfied. Even with products you have already downloaded. If you are not 100% satisfied that the information you received is valuable for your mind, body and soul, simply fill out this refund request form and we will promptly refund your money. The order details above must be the same as those of your purchase so we can identify you. If you do not know the order number, enter "don't know." Place the date of your order or the approximate date if you are unsure. With at least your name, email and approximate date, we should be able to locate the order. If we can't locate your order, we will contact you to clarify the information you have submitted. IF you have purchased printed materials and are returning them in resalable condition, we will refund your money upon receipt of the books in resalable condition. You can use this form to alert us to the return of printed materials. We do not refund shipping costs. We do not refund printed books if they are purchased from any source other than directly from Apostle Ministry, Inc. Therefore, we do not refund books purchased from Amazon or from any other book source.